​helping them meet physical and spiritual needs of U.S. service members. OP-CON is a registered and federally recognized 501(c)(3) non-profit. Thank you for your patience as we fully renovate our website. For updates, please contact info@op-con.org or our social media accounts (@opconorg). AFRICOM is our United States (Military) Africa Command. They are responsible for long-term collaborative success on the continent. Many people may have heard the term recently used in news reports regarding tragedies in the last year. THIS MONTH (December) we will be sending boxes of resources to an AFRICOM Chaplain. The name and location of this chaplain must remain confidential for security purposes. Should we receive any "shareable" photos or stories, we will be certain to share them! Thank you for your support. We will keep you posted! YOUR donations made this possible. Thank you for helping provide essential counseling materials that can even be picked up anonymously by service members. Many of our Chaplains use these resources in their many counseling sessions with Soldiers, Airmen, Marines, Sailors, Guardsmen, and those in Civilian Hospitals, prisons, hospice situations, etc. They cannot always get funding from their employing institutions for these resources. 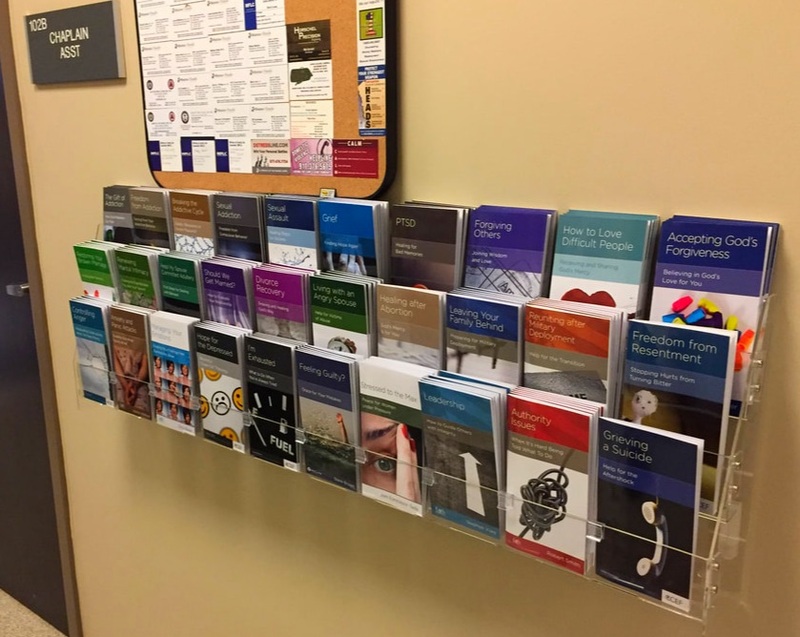 Many of our Chaplains use these resources in their many counseling sessions with Soldiers, Airmen, Marines, Sailors, Guardsmen, and those in Civilian Hospitals, prisons, hospice situations, etc. They cannot always get funding from their employing institutions for these resources. *This promotion applies to monetary donations and if requested. If you support the Box-Star campaign and would still like a shirt, please email our us at info@op-con.org. Imagine being told to build relationships with and help hundreds of people. All you're given? Office supplies. And you're under fire in a war zone. Chaplains have a nearly impossible task. They are given the responsibility to provide a voice of calm, comfort, confidential counsel, and clarity to thousands of people. The gamut of their influence ranges from Enlisted service members to four-star Generals. The Department of Defense provides them with office supplies. OP-CON (Operation Constellation) began with a simple question: What would happen if many people come together in support of our military chaplains? By entrusting resources to our chaplains, we know the supplies will be used with integrity to provide relief, support, and inspiration. When soldiers begin processing their experiences while downrange, the likelihood of advanced PTSD, suicide rates, and financial/family issues significantly decrease. The OP-CON team believes it is important for you to hear from recipients of donations. We aren't always at liberty to share some stories; but you'll find below a few stories and examples that we can gratefully pass along. "Thanks so much for your support of the ministry to Soldiers, Sailors, Airmen, Marines, Coast Guardsmen, and DoD Civilians. ... My team and I spend countless hours with them counseling, leading Bible Studies, providing worship opportunities, and communicating the grace of God to them. Every day, our goal is to creatively reach each of them (believers and others) with the truths of the Gospel, both in word and action. As religious ministry professional, we are also tasked with ensuring the free exercise of religion - something that gives us many openings to all sorts of people. Your [OP-CON's] support has been phenomenal to us in creatively reaching those serving our Country. From Bibles and books to K-cups for our coffee makers … and on to magnets to encourage those walking through the cubicle farms to gifts of encouragement for single parents, OP-CON has given us the ability to show Christ’s love in action! Every time we mention to these military members that there is a group of people who sent these items because of their love for Christ and their care for each of them, they are truly humbled that someone would think of them so much! (1) "How do they know about us? Wait, that doesn’t matter .. I’m just glad that they care!" A married couple passed along that one of the books an OP-CON team sent "was instrumental in saving our relationship, and getting us back in to God’s Word." What are other items op-con has sent? We are connected to deployed military chaplains and chaplains within the United States. 1. Chaplains tell us what they need most to enhance their ministry. 2. You and OP-CON teams collect resources. 3. We secure them, pack them, and send them to the chaplains. ​4. Often, a chaplain will request to connect with you, to provide a note of thanks. We have also had chaplains willing to Skype with churches and students as possible. A talented friend of OP-CON was inspired to make a brief video for us when we first began. We do not own the license, so we cannot post it here. See his brief video on Vimeo here. OP-CON is currently producing a video to be shared by you and those who are interested in "joining the constellation" of supporting our military chaplains. Who Can Serve with OP-CON? Anyone is welcome to help collect resources for us to send to U.S. military chaplains. Now is the time. Will you join us? Now, more than ever, unity out of our diversity is essential. Our military and those they impact need the support we can offer and the Story we have to share. Now, more than ever, we have the chance to build a joint operation between civilians and the Chaplain Corps for global influence - one by one. To request more information or to be contacted by a member of OP-CON's team, please submit a brief request by completing this form. Thank you. Help OP-CON serve our heroes. You Shop. Amazon Gives. Use this link to make donating easy. By choosing OP-CON, Amazon will automatically send a donation to us. Purchase with purpose. Find more information, inspiring stories, and updates through our Facebook page.